147 min. Walt Disney Pictures. Director: Steven Spielberg. Cast: Emily Watson, Peter Mullan, Niels Arestrup, David Thewlis, Benedict Cumberbatch, Eddie Marsan, Liam Cunningham, Gerard McSorley, Toby Kebbell. Snark being a sort of reflexive response of critics, I shouldn't have been surprised that Steven Spielberg's War Horse swiftly had me re-christening it "How Green Was My Valley, How Smart Was My Horse." It's certainly true that a man with as much filmmaking savvy as Spielberg needlessly shoots himself in the foot when he succumbs to visually quoting other filmmakers (most egregiously here in a shot ripped not from the John Ford catalog but rather from Gone with the Wind). But setting aside this small annoyance, War Horse is a stalwart family film resurrecting the plot archetype of the boy, his pet, and their unshakeable bond of love. Spielberg went there with E.T. : The Extra-Terrestrial, but that was a postmodern take, whereas War Horse consciously, and mostly winningly, embraces the old-fashioned. Newcomer Jeremy Irvine stars as teenage Albert Narracott, an English farmlad who immediately takes to the work horse brought home by his father Ted (Peter Mullan). Purchasing the muscular, long-legged Joey—an act partly prompted by Ted's prideful rivalry with landlord Lyons (David Thewlis)—puts the Narracotts into debt, prompting a suspenseful plowing challenge that cements Joey's true worth in spirit. But soon enough, Boer War vet Ted must sell Joey to the British Cavalry as it gears up for World War I action. So begins a roundelay that finds Joey under the ownership of various noble-minded characters: Captain Nicholls (Tom Hiddleston), a pair of young German deserters (David Kross and Leonard Carow), little French girl Emilie (Celine Buckens) and her Grandfather (Niels Arestrup), and so on, until an inevitable reunion with Albert. The simplicity of the narrative reveals its roots in Michael Morpurgo's 1982 children's novel, but the film also credits Nick Stafford's 2007 stage adaptation, which first hooked producers Kathleen Kennedy and Frank Marshall. The episodic structure can get a bit plodding, but if its corned-beefy blarney takes a bit of getting used to, the war horrors provide some balance (and preclude taking the wee-est members of the family). Spielberg makes typically masterful use of screen space, hard-working a motif of a rising camera (hey, uplift!) and generally enabling the photo-book-vibrant photography of cinematographer Janusz Kaminski, a regular collaborator. War Horse is full of striking imagery and exquisite location photography, from the green valleys of Devon to the grey trenches of the German front (as recreated in England). John Williams' score has a lively gait, and of course, when Spielberg calls, actors listen; the phenomenal international cast includes ever-riveting talents like Emily Watson (in Mom mode), and Benedict Cumberbatch and Liam Cunningham as military men. Given the star quality of "Joey" (actually fourteen different horses), his story is well nigh impossible to resist, a point Richard Curtis and Lee Hall's script is obliged to hammer home. The archetypal preternaturally intuitive beast, Joey is "somethin' else, that one," "a thoroughbred," a "soldier," "the miracle horse," "a remarkable horse," "a miraculous horse," and "the best of us." War Horse is too neat to be truly moving, but it's a finely crafted popular entertainment all the same, unapologetically so in the Spielberg tradition. 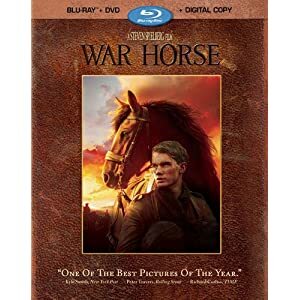 Disney's Blu-ray + DVD + Digital Copy special edition of War Horse pulls out the stops for the undeniable event that is a Steven Spielberg home video release. The technically stunning A/V presentation features a beaut of an HD transfer, with deep, well-resolved black level and subtle, true color representation that serves perfectly to recreate the filmmakers' intent. Fine details and textures pull us into the nicely dimensional image, and there's nary a distraction to be seen. The lossless DTS-HD Master Audio 7.1 surround track is, unsurprisingly, a jaw-dropper, with plenty of opportunities to impress. The frequent war scenes (and various and sundry galloping and trotting sequences) are particularly immersive, but even the relatively quiet moments put us in the landscape with discretely arranged ambience. Spielberg infamously doesn't provide audio commentaries, but there's plenty here to lap up in terms of bonus material, beginning with the featurette "War Horse: The Journey Home" (19:35, HD). Spielberg hosts two roundtable discussions: one with Jeremy Irvine, Emily Watson, and Tom Hiddleston, and the other with producer Kathleen Kennedy, editor Michael Kahn, cinematographer Janusz Kaminski and screenwriter Richard Curtis. "An Extra's Point Of View" (3:06, HD) is a fresh, if all too brief, perspective, with extra Martin D. Dew sharing his experience. "A Filmmaking Journey" (64:03, HD) is the disc's most substantial extra, a making-of doc that briskly covers the bases of the film's development, pre-production, production, and post-production as it provides behind-the-scenes footage and cast and crew interviews. "Editing And Scoring" (8:53, HD) gets the story (stories, that is) from editor Michael Kahn and composer John Williams. "The Sounds Of War Horse" (7:13, HD) hands the reins to always fascinating, Oscar-winning sound designer Gary Rydstrom. "Through The Producer's Lens" (4:04, HD) finds Kennedy sharing her set photos. All site content © 2000-2019 Peter Canavese. Page generated at 04/25/2019 02:45:52PM.